Within 24 hours, two valuable events at Princeton University, both dealing with multicultural education. A 40-year study of women at Princeton University found that women are taking a back seat when it comes to leadership positions, and it suggests reasons why. Shirley Tilghman (P.U. president) and Nan Keohane (former president of Duke and Wellesley) will discuss the report on Wednesday, March 23, at 7:30 p.m., in Dodds Auditorium, Robertson Hall. It’s free. Keohane has just written an excellent book on leadership and will speak at the Princeton Regional Chamber breakfast on Wednesday, June 15. 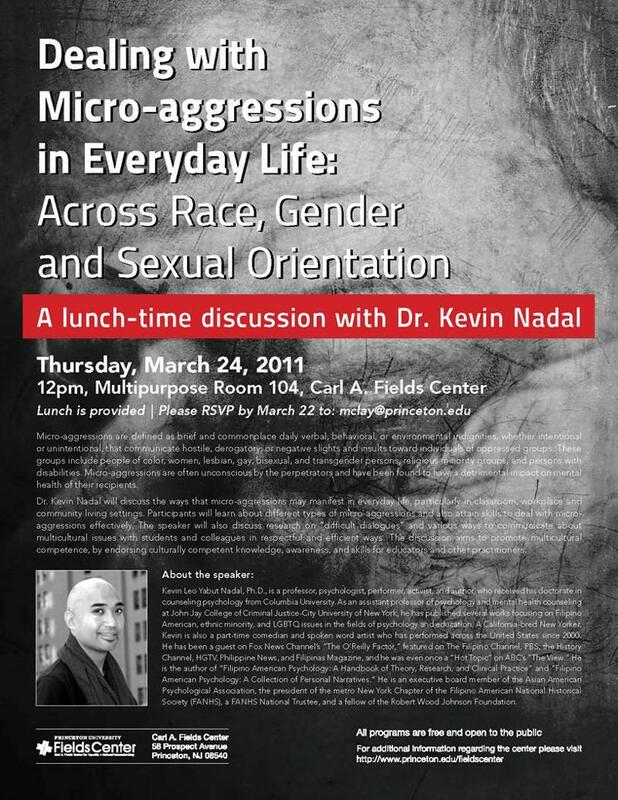 More directly pertaining to race will be a presentation by Kevin Nadal, author, comedian, and professor, who speaks at a no-cost lunch on Thursday, March 24, at noon, on “Dealing with Microaggressions in Everyday Life,” at the Carl A. Fields Center. Free by RSVP by Tuesday to mcclay@princeton.edu. For an example of a “microaggression” (which can include “Shopping While Black”) see Yolanda Pierce’s post on the Kitchen Table blog. Linda found an inspiring article, Synagogue: Breaking the Color Barrier, in Reform Judaism magazine. “It reveals the efforts needed to fulfill a commitment,” she says. The article’s author, Rabbi Susan Talve, tells of holding a baby girl at her naming ceremony. Her mother was white and Jewish, her father was a non-Jewish African American. “And when I held her at her naming ceremony, I promised her: By the time you begin to notice how you fit into your surroundings, we will have a community that includes others who look like you. You will see yourself reflected in the diversity of our temple,” she wrote. Fulfilling that promise was difficult, as you can imagine. The location was St. Louis, Missouri. Talve’s prayer speaks to the opportunity for diversity in all faith congregations: To pray for a Sukkat Shalom is to pray for a full house; a shelter that reflects creation in its glorious diversity. As we continue the holy work of uprooting the scourge of racism from this and all communities, we look forward to the time when our Jewish family will embrace Jews of all colors. Then, our Sukkat Shalom will become truly multi-racial as it was always intended to be. The former CEO of a global water initiative that provides clean drinking water to villages in sub-Saharan Africa will speak on “Faith and Ethics in the Executive Suite” tonight at 7:00 pm, in McCormick Hall 101, the building adjoining the Princeton University Art Museum. It will be preceded by a reception from 6:30 – 7:00 pm. Dale Jones, now vice chairman of executive search firm Heidrick and Struggles,” will be interviewed by David W. Miller, director of the Princeton University Faith & Work Initiative, on his Protestant perspective on issues of business ethics, leadership, diversity and executive compensation. True African American (from Ghana). African plus American (with Irish and Ethiopian parents). Kobina Aidoo, who filmed the one-hour documentary “The Neo-African Americans,” asked 13 people to describe themselves and got 13 different answers. Why is the name so important? Is it because of the tension between the American-born blacks whose ancestors were slaves, and the new immigrants who speak English with exotic accents? The monthly “Continuing Conversations on Race” has been postponed from Monday, March 6, to Monday, April 4, at 7:30 p.m., on the second floor of Princeton Public Library, The discussion, “What’s in a Name,” will focus on resolving the conflicts of the naming controversy. All are welcome to this discussion in a safe and friendly atmosphere. Meanwhile it’s been proven that immigrants are more likely to get the good job and be admitted to college. Aidoo interviews Princeton’s Douglas Massey, who notes that – of the 12 percent of blacks admitted to colleges he surveyed – an unusual percentage, 25 percent, were immigrants. That is out of proportion to the population, and for the selective Ivies, the percentage was even higher, 40 percent. In contrast to American born blacks who “have the unique sense to transform American society,” immigrants don’t want to talk about, or think about, racial issues. “I would like to have holistic conversations about everything – including race,” said one. So how do they want to be called? Rather than a variation of “African American,” most chose “black,” because it is inclusive. It can encompass and unify people of all backgrounds. At the the February 22, 2011, meeting of the Princeton Borough Council, Ann Yasuhara and Nancy Strong represented Not In Our Town’s Opinion that the Community Pool should be renovated. Here is Ann Yasuhara’s account. 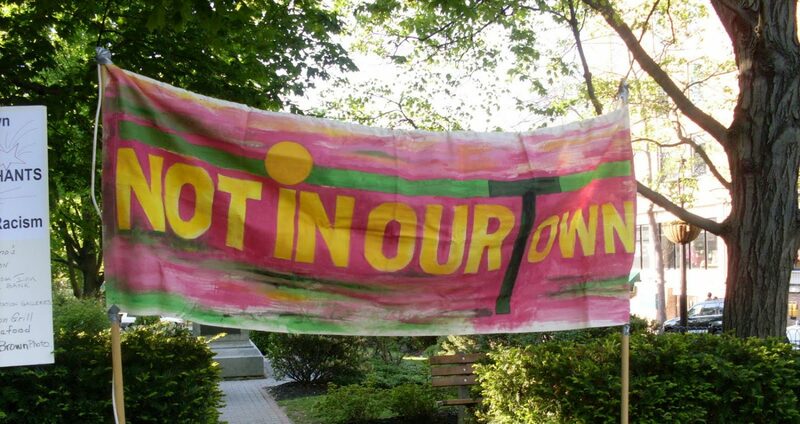 Nancy Strong joined me in representing Not In Our Town last night at an interesting Borough Council Meeting that went well and ended well. We went to represent NIOT’s position on keeping the community pool up and running for the indefinite future. Ben Stentz, the Executive Director of the Recreation Department presented the financial situation, most of which he’d told me on the phone that morning. Of particular concern to us and to some of the Council members was how those who might not be able to afford the usual fee are subsidized. It is a very thorough undertaking on the part of the Department and quite impressive. He also explained the many variables upon which the setting of the pool fees depend and how it is impossible to predict their value over the next 20 years (the time the Recreation Department has to pay the Borough one million dollars for its part of the expenses). He gave an upper bound of $50 increase and also said how low our fees are compared to those in surrounding municipalities. Then Deana Stockton, Project Engineer from the Township Engineering Department, showed us the plans and explained the simplifications from the last presentation, and how much money this would save. This was the first time Nancy and I had seen any plans and they certainly looked very nice. There were questions of various kinds from the Council, but never hostile. The Mayor asked for public comment. Four of us commented. There were two persons who, as I was told, had been pretty negative. At this point they weren’t so much so, but did make specific points, in particular, how long would the proposed pool last. (Answer: at least another 40 years.) Then I spoke saying that Nancy and I were there from NIOT. I didn’t read our letter, but referred to it and then spoke about those few chances that we have to be in real community and how wonderful it is when we are. I mentioned as examples: Communiversity (but only one day a year), the Library (almost every day) and the pool (some months of the year) and how important such opportunities are. Since the pool is one of those few chances, it is important to our mission that it continue. After me Dana Hughes spoke as a person who had grown up in the community, has worked with youth in the community all her life and how extremely important the pool is. She was terrific. The Mayor then requested that the question of the bond issue be moved and seconded and deliberations begun. Barbara Trelstad said, quite rightly I thought, that if she had known earlier about the system for subsidizing membership costs, she would have had a more positive attitude. Roger Martindell spoke about how he’d like to see the financial arrangements of the Recreation Department structured – along the lines he, Roger, had outlined to me on the phone. A general agreement on that point was made. After a few more friendly interchanges the vote was taken and the proposed bond issue passed unanimously. I don’t really know what the many month process was for arriving at the decision. But several on the Council spoke about how new and different and sometimes difficult it was to engage so many segments of the community, but how important that had been and should be considered in the future. I thought that was absolutely excellent. After the pool part of the meeting was over, most the audience (pretty good size) reassembled, excitedly and joyfully, in the hallway. We got lots of people thanking us, almost more warmly than perhaps we deserved. I have been reflecting on this NIOT effort and the one regarding the supervision of the police department last year. Do our efforts really matter? I think that they do. We alert people to our view and urge them to think about the matter more carefully from our point of view. And I think they do. Even though 2 weeks ago it didn’t look like the pool would pass, I think we helped open the discussion, but it probably would have passed without us. But in the police case I am pretty sure we, along with the Latin American Legal Defense and Education Fund (working together) turned it around. Without us, I doubt that it would have happened.